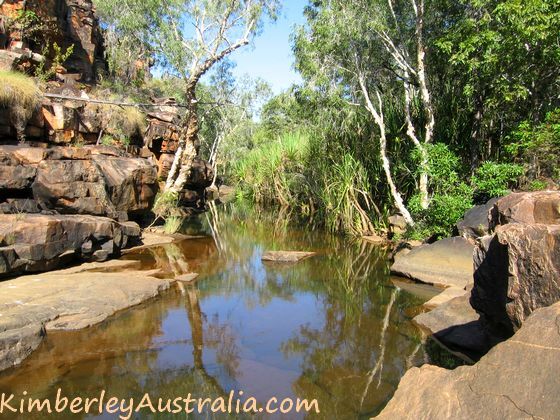 Charnley River Station is located 43km off the Gibb River Road, about half way between Bell Gorge and Manning Gorge. These days part of the station is managed as a wilderness sanctuary but luckily tourists are still welcome. 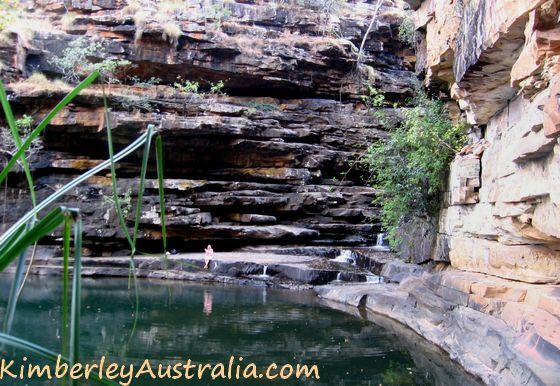 It takes some driving and walking to get to Charnley River's gorges and swimming holes, but it's well worth the effort as you'll see below. 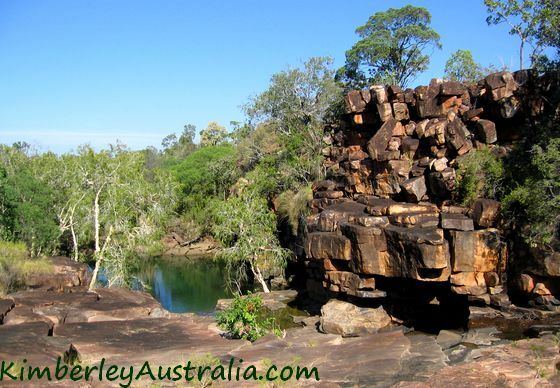 Until 2011 Charnley River was a working cattle station that also grew a range of seed crops. The station was formerly called Beverly Springs and run by Marion Nixon and her husband. Marion became known for her book "Children in the Sun", where she describes her life bringing up her five children on the station. 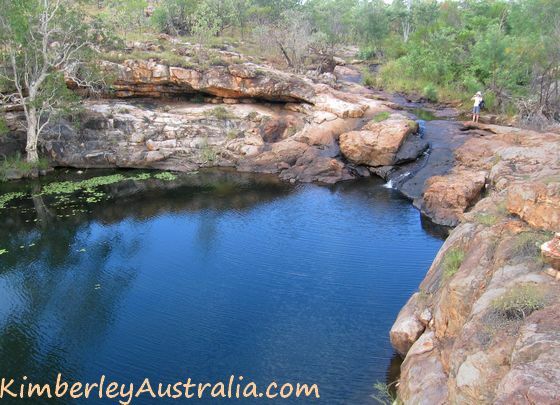 Charnley River was the very first station along the Gibb River Road to offer accommodation to tourists. In August 2010 Peter and Cheryl Camp bought the station and renamed it into Charnley River. The tourism side was Cheryl's baby, who mainly wanted people to enjoy the place and have a good time. The money was in the cattle, not the campers! 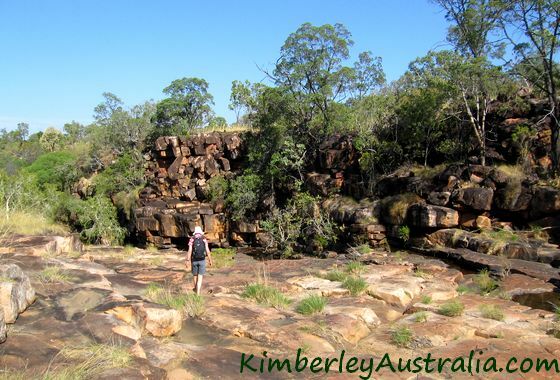 We are lucky that she felt that way about tourists, because Charnley River covers some great country. 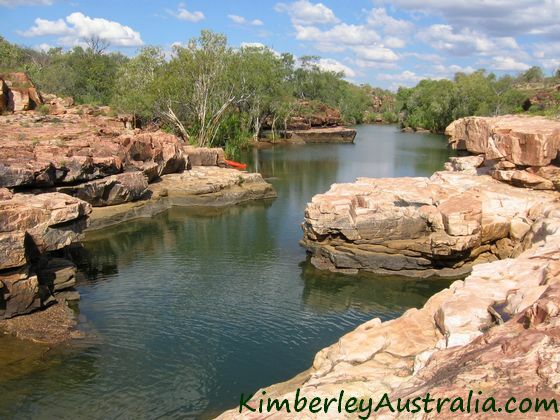 In February 2011 Charnley River changed hands again. 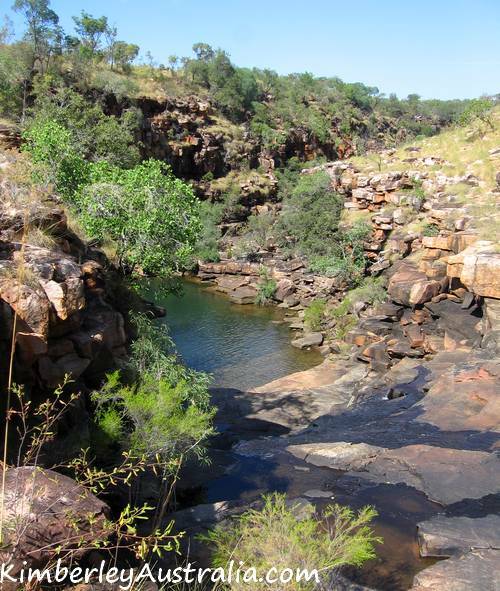 Part of the station is now managed as a Wildlife Sanctuary by the Australian Wildlife Conservancy, which also still runs the tourism side of the business, just as they do at Mornington Wilderness Camp. 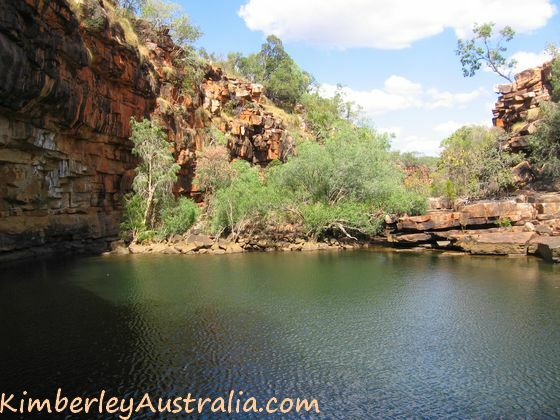 Charnley River has several fabulous gorges and swimming holes. 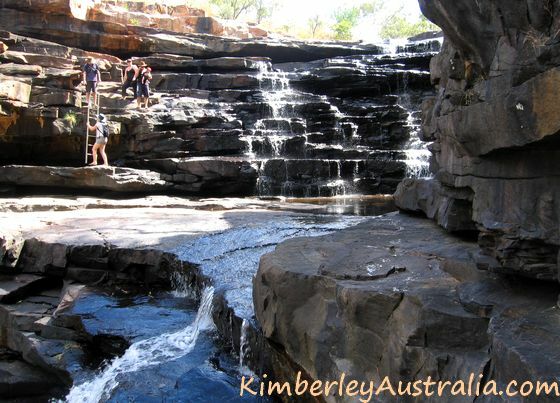 It is a very welcoming place and has become quite popular with tourists. 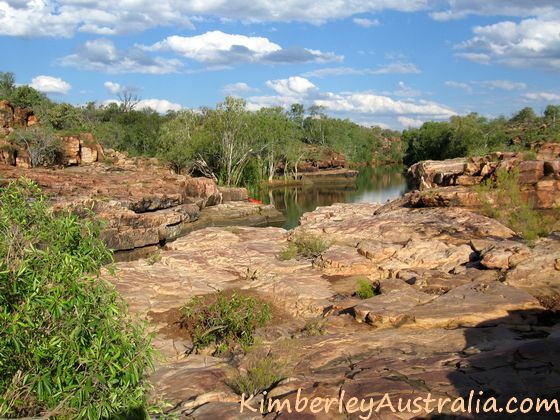 But luckily it is not as overrun yet as many other places along the Gibb River Road. The station caters to general tourists as well as tours and specialist groups. Since 2014 accommodation and meals are not available any more but you can still camp here. Camping is available at the large campground near the homestead. (Bushcamping used to be available, but no more.) It offers good facilities and lots of shade. From there you can take self guided driving tours, explore their many gorges on foot or by hired canoe, arrange a scenic flight or a guided tour, go birdwatching... It's not hard to keep yourself entertained for a few days! You can find contact details and prices near the bottom of this page. The photos below show the top pool. 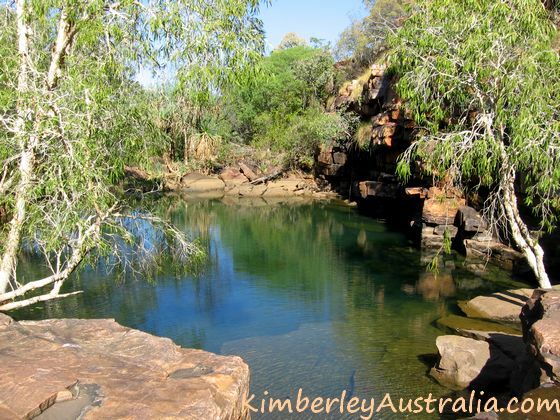 It's a good place for a quick dip and a picnic if you have little time. 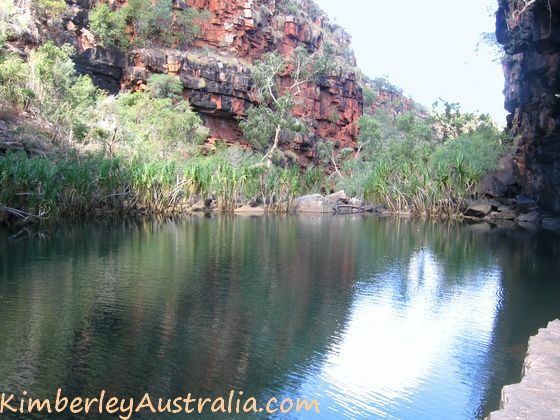 Beautiful Lillie Pool is located above Grevillea Gorge (more on Grevillea below). Theoretically you can walk from one to the other but it isn't easy and hardly anyone does so. 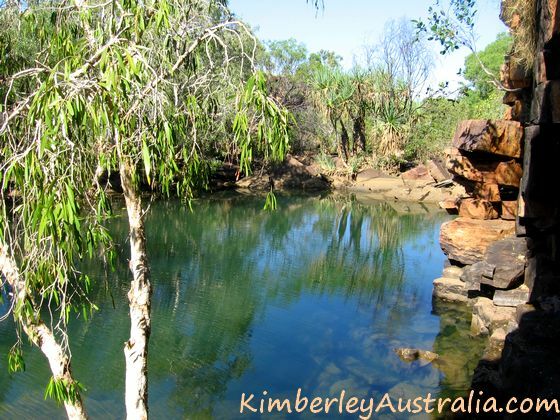 Lillie Pool is a lovely and peaceful place for relaxing and swimming. A ladder is there to help you down, should you need it. Looking from the first pool down towards the second. Climbing down to that can be a challenge... And you better not be scared of heights! Here is the drop that you have to climb down. Please note that climbing down to the second pool is dangerous and definitely not encouraged by management! The rock wall that connects the first and second pool. Most people don't come down here, so if you do, you have a good chance of having it to yourself. Again, please do not take any risks here. 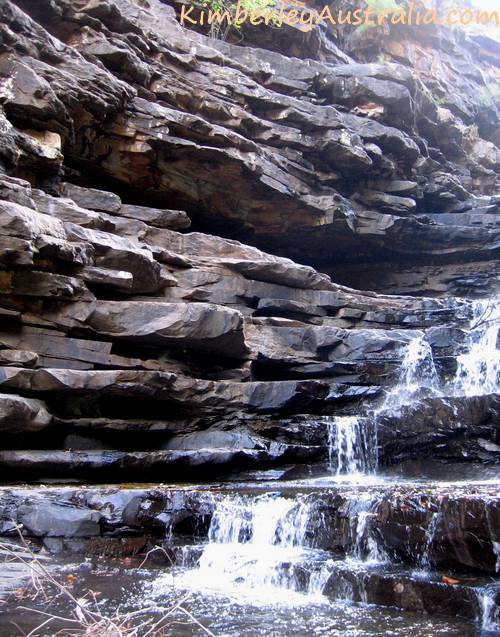 The rock is very slippery and a slip could be fatal. 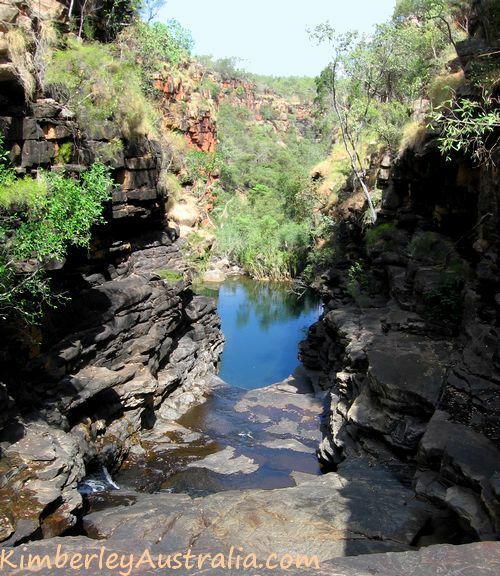 The second pool of Grevillea Gorge is also large and deep. This second pool is much cooler and shadier than the first. 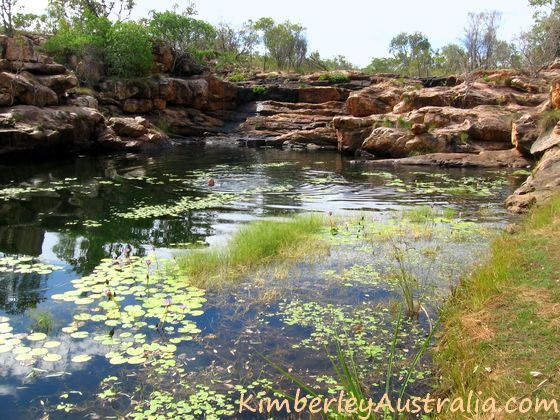 You can continue to find a third small pool (no swimming here due to a resident freshwater crocodile) and follow the creek to find some rock art sites. 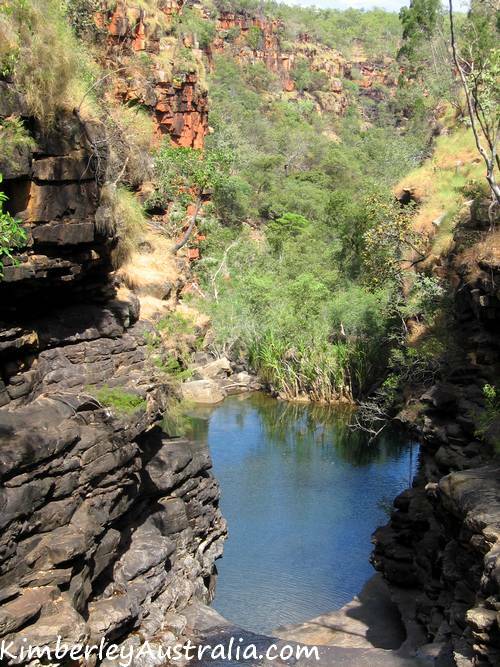 Dillie Gorge is also accessed via the Grevillea Gorge track. (The turn off is signposted.) It does not require any rock climbing prowess. Just walk down from the car park and enjoy! The red canoe you see in the photo is available for hire. But you could also just take your own. Or you simply swim down as far as you can see in the picture. Or you just stay where you are and laze and sunbathe! I think by now you agree to what I said above: it's not hard to keep yourself entertained for a few days!